Buying a recruiting tool is a number one priority for many recruiters and other HR professionals in 2018. Startup or an enterprise, talent acquisition has become one of the most challenging, yet crucial, strategies necessary for every firm’s growth and development. When buying a recruiting tool, identifying your recruiting goals and challenges should be the very first step. This approach will make the decision about which recruiting software to buy much easier. Even though there are many different things to consider when buying a recruiting tool, there is a proven strategy that helps in making the best decision. The very first, and in my opinion crucial, step is to clearly define your own recruiting goals and challenges. These can be things such as get more applicants through career site, find the right job candidates, have better way of approaching passive candidates, improve hiring workflows, reduce time to hire or any other recruiting goal you may have. In this post, I have identified some of most common recruiting goals and challenges that can be your guide for buying a recruiting software. Based on different stages that candidates go though, companies may have different recruiting and hiring challenges. I have identified the most common challenges based on 6 different stages of a candidate journey. 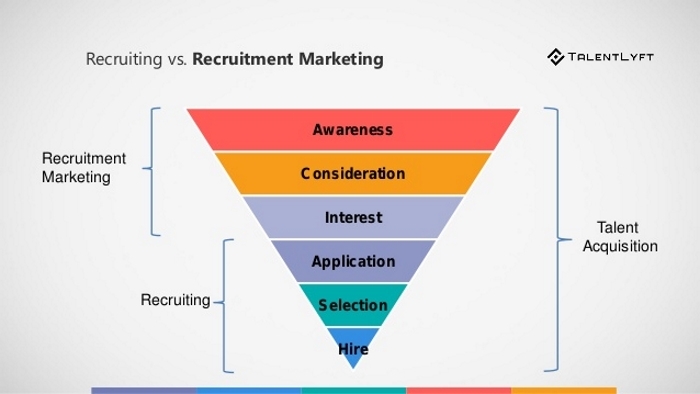 Going through these stages will significantly help you in identifying what type of a recruiting tool do you need. Candidate awareness is a stage that never stops. This stage doesn’t include only communicating your job opening, but also making candidates aware of your employer brand and employee value proposition at all times. Knowing your challenges in the candidate awareness stage, make decision making about recruiting software purchase much easier. Consideration stage is the stage in which you are trying to convince candidates to consider your company or organization as their employer of choice. To be able to pick the right recruiting tool, identifying recruiting goals and challenges in this stage is crucial. This is not an easy process, especially today when a lot of employers are putting much time and effort in it. The key here is to have a clear candidate engagement strategy for the candidates that have become aware of you. Having a good candidate engagement strategy has become extremely important in the world of HR and recruiting, especially for some hard-to-fill roles. If you don’t offer useful content, timely and engaging communication, you are likely to lose them over your competitors. Engaging passive candidates and providing an excellent candidate experience is one of the best ways of improving your employer brand. Do you know what are your recruiting challenges when it comes to making candidates interested in your company? Once you have made candidates aware of your company or a job opening, had them to consider you as their next employer, you want them to express the interest in your job opening and move to the next, application, stage. Are you looking to improve your career site? Get our guide for optimizing career site! If you don’t have many job applicants, you need a recruiting tool that offers solution to this problem. After you have moved a candidate through the previous 3 stages, the challenge becomes to turn them into applicants. It is not uncommon that, after you manage to attract candidates and convince them to consider you as a new employer, you bring them to your career site, but they never apply. Inability to track application form abandon rate and get insights on why candidates leave. This stage starts at the point when you have job applicants, and ends with a new hire. That being said, there is still much work to do. At this point, you should have high-quality applicants, and you are moving to the hiring process. Unfortunately, many companies’ struggles don’t end here. Moreover, for some of them struggles start here. Once you have selected a candidate, recruitment marketing and ATS usage stops. However, for companies that use solutions such as HRIS, it is important to have the ability to integrate. Inability to integrate with employee management platforms. Which Recruiting Software to buy? Now that we have identified all the possible recruiting challenges an HR professional or a business owner can be facing with, let’s move to the next chapter that will help you identify a type of a recruiting software should you buy. The main goal of the following chapters is to define types of recruiting software, such as ATS and Recruitment Marketing. If you are looking for a 2-in-1 solution, schedule a demo with our team to see how we have helped companies showcase their Employer Brands, attract talent, and streamline their hiring efforts.